The commitment of the Sisters of Bon Secours is the foundation on which Bon Secours Health System is built. Bon Secours means "good help" in French. Just after the French Revolution, when France was in a state of upheaval and devastation and all that was institutional was being rejected, twelve young women living in Paris became aware of the great need to care for the sick and dying in their own homes. Unlike other carers, they remained in the home both day and night, demonstrating God's healing presence by their compassionate care. The group chose Josephine Potel as their leader and in 1824 the Congregation of the Sisters of Bon Secours was founded in Paris. 1997: Bon Secours Health System is established as an independent company, limited by guarantee, with a not-for-profit status. Each January 24th, BSHS celebrates its Foundation; in this it marks all the years of ‘Good Help’ provided for the sick, the dying and their families, within a Catholic ethos. Since 1824, the hospitals have changed, the equipment is more modern, medicine and procedures are far more advanced, but the Care still continues, delivered by nearly 3000 staff. That ‘care’ is BSHS Mission in action; BSHS translates its care for the sick, and for its staff, into action every day through the living out of its seven core values. Every day this Mission of care happens without staff or patients being aware of it; patients experience it through the welcome they receive when they come to be admitted. They experience it in eye contact, through caring touch, through friendly and courteous greetings, and tone of voice. They experience respect for their dignity, professional quality care, delivered with compassion. This happens every day across Bon Secours Health System; it is something that we in BSHS never take for granted. In BSHS, whether staff work directly with patients or not, they know that they are all part of their care, because all of our staff make up the Bon Secours Health System family. Every day, the staff bring BSHS Core Values alive in the way in which they approach their work, the patients, their families and each other. After only 2 years as the first Congregation Leader, Sr. Josephine Potel sadly died of TB. She was succeeded by Angelique Geay, who took up the reins of leadership for the next 34 years. She was instrumental in the growth of Bon Secours in France, but resisted taking the young Congregation international, declining all requests for Foundations in other countries. In the late 1860’s, though post famine, Ireland was still suffering its effects. There was great poverty. The More O’Farrell family heard of the great work the Bon Secours Sisters were doing in France and invited them to come to Dublin. In 1861, following the death of Sr. Angelique Geay, Bon Secours first foundation outside France came into being; five Sisters arrived in Dublin and set up their first convent in Granville Street. Besides obvious language difficulties, they encountered resistance to the new concept of religious sisters nursing people in their own homes. They weren’t in Ireland very long when a Cholera epidemic broke out in Dublin. Amazingly, though they were in the front line of infection, none of the sisters contracted the disease. Their hard work earned them great respect and within 3 years a larger house was needed to accommodate the growing numbers of Sisters and they moved to a larger premises in Mount Street. Many Irish women had joined the Sisters and the community was active in many aspects of Irish life during the next 60 years – including care of hunger strikers in War of Independence 1920. In 1932 the ‘Penny Dinner’ Hall was established in Holles Street leading to ‘Meals on Wheels’ and Penny Dinners some years later. This has since been taken over by Crosscare who are carrying on this great work today. Endoscopy Department: it is the first private endoscopy unit in Ireland to be awarded JAG Accreditation. Cardiology: This has undergone monumental change in recent years and the Department is now at the forefront of cardiology services in Ireland. Pastoral Care: BSHS focuses not just on the phsical needs of our patients, but on their emotional and spiritaul needs too. Our Hospital Chapel provides a place of comfort to patients, their families and staff. It is also the centre of many special celebrations facilitated by the Pastoral Care Team. The Sisters of Bon Secours are no longer at the forefront of the care, but the Mission still continues, delivered by our excellent staff. At the invitation of a Cork priest, Fr. F. O’Connor and with the help of his brother who was a doctor, the Sisters set up in Cork in 1867 living initially in Dyke Parade, later moving to what is now the Cork Museum and finally to College Road, building their first Convent. The current Bon Secours Hospital in Cork was established in 1915, and this has expanded significantly over the years. The building of this hospital by Sr. Sulplice Hayes, the superior at the time, signaled a major shift of focus for the Sisters, moving from home-based care to Hospital care. This reflected the rapid advances in medicine happening at that time. The Sisters established a Maternity Hospital in 1958 catering for over 2000 births each year. This was transferred to the new centralised Cork University Maternity Hospital in 2007. April 1867 Four Sisters arrived in Cork from the Motherhouse in Dublin. They were Sr. Bertille, Sister Leon, Sr. Marcelle & Sr. Celine. They worked with the poor in the Marsh Disctrict, and the wealthy in the suburbs. 1915: Health Care Changing in Ireland; First unit of present hospital opened, developed by Sr. Sulplice Hayes. 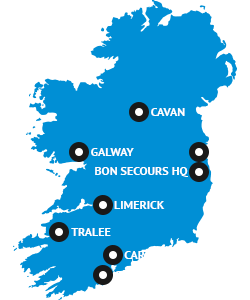 1997: The sisters established the Bon Secours Health System Ltd in Ireland to co-ordinate the management of the hospitals under one limited company. 2017: Major extension project commences. On the 8th of September 1879, at the invitation of Lady Donovan, four Bon Secours Sisters with their distinctive headress came to live in Tralee to care for the poor: Sisters Marine, Hilary, Ferdinand and Catherine. They first lived in Denny Street and moved to a larger house on Strand Street in 1882 paid for by the generosity of the Catholic and Protestant townspeople of Tralee. This is the Convent the Sisters still occupy. Between 1902 and 1937, at the request of the local health authorities, the Sisters cared for the sick in the town’s Infirmary, as well as in their homes. Between 1937 and 1987 the Sisters ran Edenburn, first as a unit for patients suffering from TB, and later as a home for the elderly. In 1921 the Sisters had purchased another large private residence with eight acres of land a short distance from the convent on Strand Street and this became the nucleus of the present hospital. It opened its doors to the first patients in 1922 and was known as Bon Secours Nursing Home. Since that date each decade has seen upgrading and re-furbishing of this building. Today BSHT is a 150 bed acute hospital employing approx. 500 people and offering a wide range of consultancy services. In 1954, the Little Company of Mary Sisters founded a hospital on the current site at Renmore. In 1985, the hospital, known as Calvary, was sold to a consortium of investors including local doctors and in 1986 it reopened as Galvia Hospital. In 1999, the hospital was bought by Bon Secours and integrated into the Bon Secours Health System. There have been significant expansions of the hospital since 1999. In 2013, we opened a new Medical Assessment Unit. This has proved to be a valuable resource for patients and the community, has been welcomed by GP’s and is essential to our desire to respond to the needs of the community.